Going Dutch in TCR – how to mix buses and cycles? Home / Outline of past campaigns / Going Dutch in TCR – how to mix buses and cycles? LCC members voted for Going Dutch as a campaign for 2012 mayoral elections. CCC members suggested that we should try to persuade Camden Council to implement an example in Tottenham Court Road when it becomes two way. Camden Council has involved CCC in the West End Project (i.e. Tottenham Court Rd/ Gower St/ New Oxford St/ Princes Circus/ etc) from it’s start in late 2012. These discussions formed a part of our regular meetings with Camden officers. As the accounts here are informal, we have not recorded names. We started by making counts on the cycle route between Torrington Place and Howland Street as this is the part of TCR most interesting to cyclists. Click here to see the detailed counts in new window. 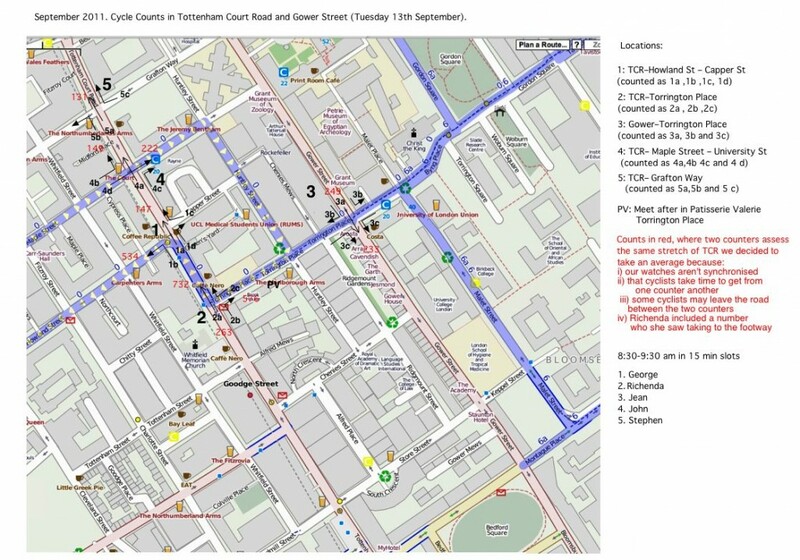 Camden Council’s LIP states that Tottenham Court Road and Gower Street will revert to two-way working and that TCR southbound will be buses and cycles only. We have considered only the stretch between Torrington Place and Maple Street so far. These ideas together with suggestions from members and from a meeting at LCC are shown here. Officers had been reading about Going Dutch: -we agreed that comfort and safety for cyclists are the main criteria and that in general this would be achieved by separation in busy streets and by sharing in quieter ones; we noted that Exhibition Road is a bad example of Going Dutch because the Dutch would separate cyclists in such a busy road. Time scales: affected by St Giles Circus, hopefully St Giles Circus and TCR will be completed 2015-16.
officers acknowledged that evaporation happens but said the Torrington Place-Howland Street route is needed by motors: CCC noted that this route is also on LCN+ Route 0 westbound and has heavy cycle use; CCC was very concerned about this stretch of road having two narrow traffic lanes with a narrow cycle lane. 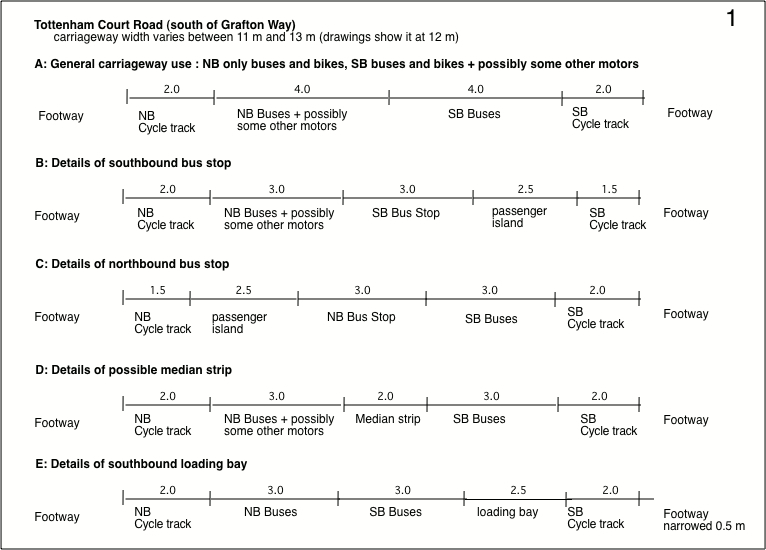 Southbound bus+cycle contraflow: (3 metres in general with 4.5 metres at bus stops). The median strip is to be 1.5 m. There was considerable anxiety about cyclists’ comfort when sharing with six bus routes in a 3 m wide track with kerbs on both sides. It was noted that cyclists are not allowed to share a similar track in Bloomsbury Way. CCC asked for confirmation of a 20 mph limit (it was confirmed) . CCC raised the need for no motor right turn from westbound Torrington Place to northbound Gower Street (for safety on cycle track); officer said he thinks that will be the case. We were pleased that Brian Deegan has been brought in to help with designing for cyclists. In addition some major design changes are proposed: they seem to be aimed at opening up all movements to cyclists as well as calming the street to ensure the 20 mph limit which now seems to be a definite criterion. The sketch illustrates an idea for use at the stretch of road between the Bayley Street/ Percy Street junction and the Windmill Street/Store Street junction. A similar one will be deployed between Tottehnam Street and Torrington Place. 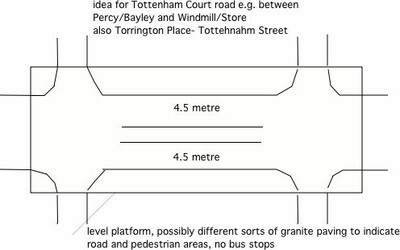 The materials for the platform have not yet been decided, but officers hope there will be no level changes (see Byng Place where we have a tiny change in level). The signals at Bayley Street and Howland Street will be removed. In principle, cyclists will be allowed to make all turns at the junctions in TCR, whereas other vehicles will be restricted. Currently Percy Street and Bayley Street support contraflow cycling and a crossing over TCR is essential to the proposed SSL relief route. Note that we need to remind some of officers about this concept. Further one-way exceptions for cyclists will be considered elsewhere e.g. in Chenies Street (Store Street already has two-way cycling as far as Alfred Place, more could be considered). CCC stressed the need to be able to cycle between Capper Street and Howland Street. Two-way cycling in Huntley Street possibly to be re-opened (as an issue). Should two-way cycling in Howland Street and Maple Street be introduced instead of the current segregated with flow tracks? Issue to be resolved by CCC. A) a maximum of 13 m of width; only 9 m available to motors which implies a single general traffic lane in each direction. Buses only SB. Only applicable north of Bayley Street. B and C) the cycle track is behind the island bus stops as being trialled by TfL on some cycle superhighways. 2.5 m passengers island at footway level outside the cycle track; long enough to cater for the number of buses expected to stop at the same time. The cycle track raised gently to footway level.D) a 2m wide median strip and 3 m traffic lanes could be deployed where the road is >12 m wide (e.g. north of Torrington Place) or where one of the footways is narrowed; but not by bus stops. Opportunity for cycle paring.E) shows an island loading bay on the SB side of the road. On the outside of the cycle track (like the island bus stops). When not in use it would provide an intermediate stopping point for pedestrians (dropped kerbs). But following this, Camden did some drawings that showed that in most of TCR there is not room for island bus stops and wide cycle tracks mainly because bus stops are may need to be opposite one another. We already acknowledged that the island loading bays was a bad idea. At the northern end, e.g. outside Warrne Street station, there is too much contention between bus passengers and cycles to allow for island bus stops. In TCR Camden has aimed for a street that satisfies the needs of pedestrians first, acknowledges the needs of cyclists and buses. In order to provide space for cycling, they plan to eliminate as much through private motor traffic as possible. They had always intended that SB would be only buses and cycles with a few deliveries over a short stretch. More recently they have proposed eliminating NB private motor vehicles during most of the day. That is, no taxis or private motor vehicles are allowed to enter from the north at any time and from the south between hours to be decided. TCR: 2 by 4.5 m lanes to be shared by buses and cycles. Gower Street: 2 x 1.5 m lightly segregated cycle lanes and 2 x 3m motor lanes. Cross traffic will be allowed e.g. between Torrington Place and Howland Street. We believe that this will continue to be a rat run and will continue to press for a filter at some point in Howland Street. The consultation was published on 8th June 2014.